The Real CBD - Pets and what CBD oil can do for them. What can CBD oil do for your pet? As we get to know more about the effects of CBD for mankind, we find ourselves naturally asking: Could CBD oil help our pets? A growing number of veterinarians believe cannabidiol (CBD) products can be effective in treating an array of conditions in dogs and cats, from anxiety to a lack of appetite. Scientifically, dogs (and most mammals) have a similar anatomy to humans. Studies in the last decade have shown that the endocannabinoid system can be found in most mammals. 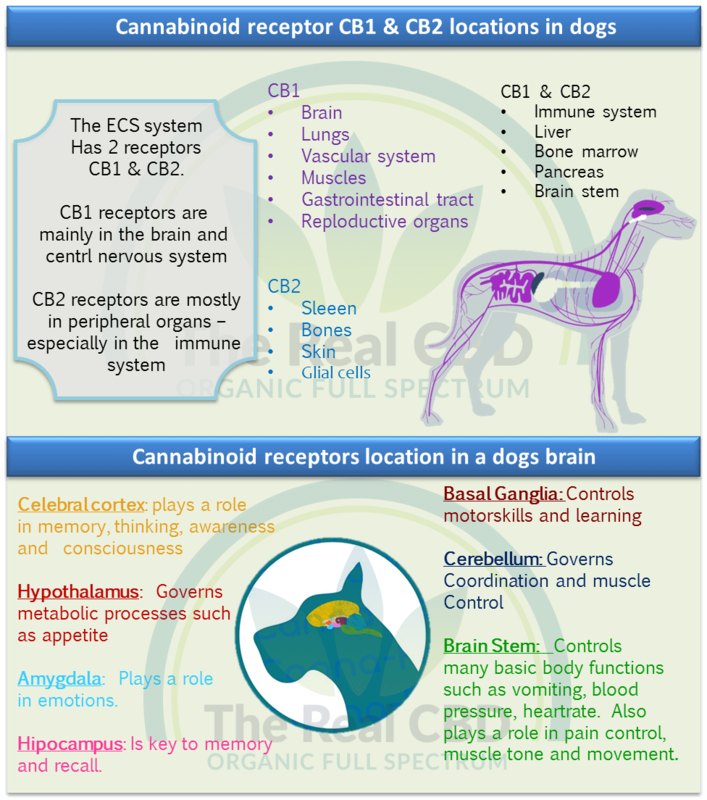 Considering that CBD works directly with this nervous system, we can confidently conclude that CBD will have some sort of influence on our dogs. Early research and anecdotal testimonials show that CBD has helped our pets in many different ways. CBD for our pets is available in many convenient forms. Extracts can be given from a dropper bottle directly into the mouth, added to food, dropped on a treat, rubbed into the bare skin or inside the ears, or dropped on an animal’s paw so they will lick it off. and how often to give. Typical suggested starting dose: 1 mg – 5 mg CBD per 5kg (10 lbs) of body weight. Start with a dose on the low end of the range. Changes usually occur within 30 minutes. If there is no change after an hour, increase the dosage. Occasionally improvements will take more than one treatment. To control pain, give approximately every 8 hours. For other uses, or to break unwanted behaviour patterns give once or twice a day. Remember that you cannot overdose and there is no toxicity associated with CBD.